It’s not easy being a student at Brandeis with Asperger Syndrome — an autism spectrum disorder (ASD). 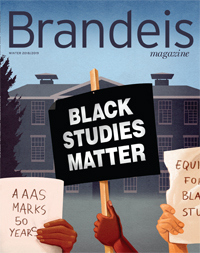 In ninth grade, however, aspiring to attend Brandeis would have been impossible. My ASD got in the way of every aspect of learning and socialization. I could not stay focused in class — not for more than 30 seconds, according to my English teacher’s report for my individual education plan meeting. But this was nothing new; these problems had affected me my whole life. Everything changed dramatically in February 2004. I was in a freshman history class, and suddenly I found myself participating and even dominating class discussions. Until then, I had never raised my hand or answered a question unless unexpectedly called on, in which case I would not know the answer. I needed an aide nearly full time to keep me on task. But now, for the first time in my life, I could truly function independently. It felt like a part of my mind that had been turned off was suddenly switched on. Teachers and staff at my high school expressed amazement at my success story — they’d never heard of anyone else with ASD making such progress. Sophomore year I was placed in all honors classes and began taking a foreign language. Inspiration helped make this transformation possible. Another student in the class had similar difficulties staying on task and joining in class discussions. I recognized some of my own problems in him, and I badly wanted to change my academic performance. Yet inspiration alone was not enough. I had wanted to make this change my whole life, failing at every previous attempt. All of the drugs I took to improve my attention gave me horrible side effects. Then about three weeks before my dramatic change, I began taking injections of methylated B-12 — a vitamin with a wide degree of reported success in autistic children. I believe I owe my college career to it and all my other supplements. If getting into college was hard, adapting to college life was a whole new challenge. I was severely impacted by suddenly being three hours from my home in Cos Cob, Connecticut. Unlike high school, most of college life takes place outside the classroom — time that I suddenly had to fill. I killed a lot of downtime in monotonous hours online (developing an Internet addiction I still struggle with). I had to learn to remind myself to turn work in on time and to take my vitamins. Socially, college introduced a whole new world of temptations. In high school, I only went to one party. Freshman year of college, there were suddenly tons of parties. I crashed parties held by complete strangers, who didn’t seem to mind. Parties and alcohol did not solve my social problems, however, and by sophomore year I kicked the habit altogether. Yet my autism spectrum disorder remained a deep, dark secret to all my professors and peers. I was afraid of being labeled and stigmatized. Sophomore year, for the first time in my life, I felt comfortable enough to disclose my condition to other people. Most were understanding and supportive. Though this did not earn me any lasting friends, I at least felt I was no longer hiding anything. During my junior year, I coplanned Autism Awareness Week, out of which I cofounded Spectrum — the first and only autism awareness organization at Brandeis. I then helped organize a series of events for Autism Awareness Month. By disclosing my ASD, I not only became more comfortable with myself, I was also able to help others learn about autism. What was once a source of considerable hindrance is now cause for pride and strength — for all that I accomplished in spite of the obstacles thrown my way, and for my unique position to share my experience on the autism spectrum. Jake Crosby ’11 is majoring in history and in health: science, society and policy. He is a contributing editor to ageofautism.com.